Sloppy joes, hickory smoked pork ribs and shrimp gumbo. It’s the cool thing right now. American diner food, that is. And while Bayswater Road may be haunted by a dark past of failed restaurants, the team behind Fei Jai and Barrio Chino are breathing new life into Kings Cross with their latest venture – Bayswater Diner. For Americans, the diner concept is as familiar as malted milkshake and pecan pie. In Australia, however, the Jerk-chicken-wing concept is somewhat foreign. Perhaps this is why owners Peter Lew and Nicole Galloway have held back with their disappointingly conservative reincarnation of a classic American diner? There are the token white paper placemats, plastic bottles of ketchup and mustard and leather booth seating but there is something missing. Maybe it’s just too elegant to be the real deal? The menu, on the other hand, features all your favourites with cheeseburgers, corn dogs and cobb salads dominating. 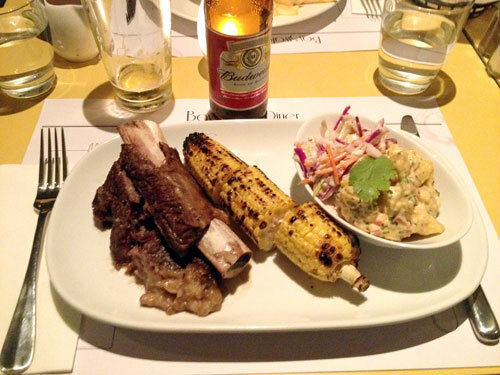 A clumsy dish of beef short ribs is served with grilled corn that is simply begging for a dollop of mayonnaise, a sprinkling of parmesan and a dusting of chilli. I mean, really – if you wanted to be healthy – you would have ordered the pan fried barramundi, not ribs. While on the barramundi-topic, the skin is crisp and the flesh is moist. Not only aesthetically beautiful, the fish is served with salsa crudo and steamed broccolini – both of which work well together. The haagie roll beef brisket sloppy joe gives Bayswater Diner street-food-cred however it is the pecan pie served with Jack Daniels cream that is a taste of the true America. For those not convinced by the diner-effect, there are plenty of non-grease options such as heirloom tomato salad with house smoked goat’s curd and house made pasta with ricotta and basil. Bayswater Diner will happily satisfy, just as long as you have a wallet that can cope with a little beating.